Rhythm & Blues guitarist Snooks Eaglin, a legend of the New Orleans music scene, died on 2/18 at age 72. Blind since early childhood, he became a giant in a city of many giants and performed with everyone, including Professor Longhair and Allen Toussaint. 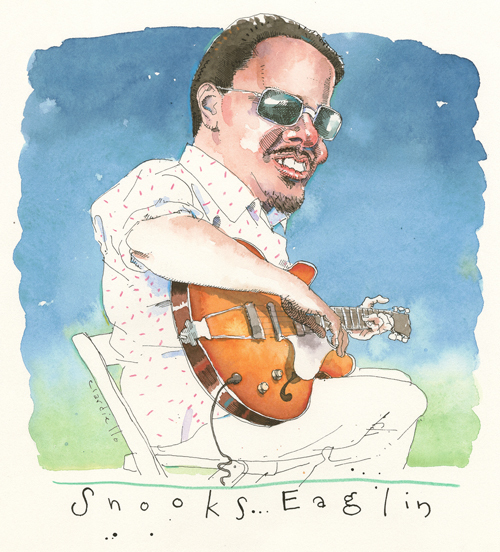 Snooks was a fixture at the annual New Orleans Jazz Fest which is where I had the chance to see him about 10 years ago. This piece was originally done for a series of CD covers for Capitol Records that I did in the mid-90's called the Capitol Blues Collection. Great artist. Both of you. Poetry in line and wc technique. So fine Joe. I saw him play in a bowling alley in New Orleans. Really, really intense! On the other sider of the alley Johnny Adams [the tan canary] held forth. 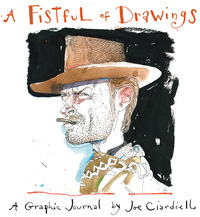 He was an awesome, unheralded American artist. Great picture, man!